Senator Jeff Session, one of the real heroes of the battle to defeat amnesty for illegal aliens and open borders legislation that would permanently flood America with low-cost, low-skilled workers had a few choice words for his fellow Republicans. Sessions has it right on the money. Someone needs to look out for America’s working families, and it certainly won’t be the Democrats, who long ago abandoned being the Party of the little guy in favor of the kind of identity politics that drives them to create a vast slush fund for radical Hispanic political groups and tuck it away inside their “Gang of Eight” so-called immigration reform bill. Senator Session argues, and we agree, that the single most destructive feature of the Senate’s immigration bill is the massive permanent surge in low-skill immigration that would reduce wages and increase unemployment that would be created by its passage. The problem for the GOP is that leading Republicans are finding it difficult, if not impossible, to disentangle themselves from the web of corporate money and influence that has all too often caused the Republican Party to look like the Party of Big Business, when its historical and philosophical roots are in the encouragement of the American exceptionalism that benefits entrepreneurship and Main Street. Senator Jeff Sessions is right: The White House and Senate Democrats are shamelessly coordinating with a small cadre of CEOs to pressure House Republicans to yield and pass the Senate amnesty for illegal aliens and open borders bill. The question for the rest of the GOP on Capitol Hill is, will Republicans tell these special interests to get lost and be the one party that will defend American exceptionalism and the interests of the millions of Americans looking for better jobs and better wages, or will they continue to opt to go with the Fortune 500 at the expense of America’s workers and small business people? 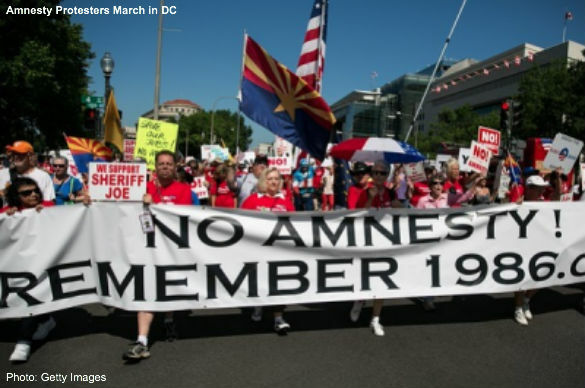 Sign and share the STOP AMNESTY PETITION NOW!